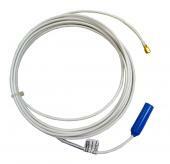 The 3000 Series Cable is available in a variety of lengths with or without protective cable armor. This cable is for use with products within the 3000 series. Scroll to the bottom of the data sheet below for more information on the 3000 Series Cable.